Insular Life volunteers do not just teach values ed to the GK Manggahan children, they also let them experience the joy of volunteering and being grateful for blessings received when together, they visited the Hospicio de San Jose in Manila. 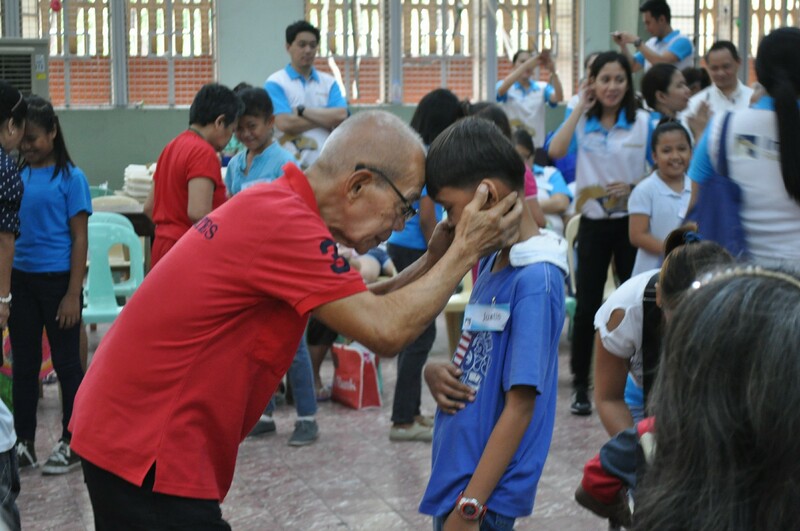 Photo shows a Hospicio lolo during a game where they partnered with the GK kids. 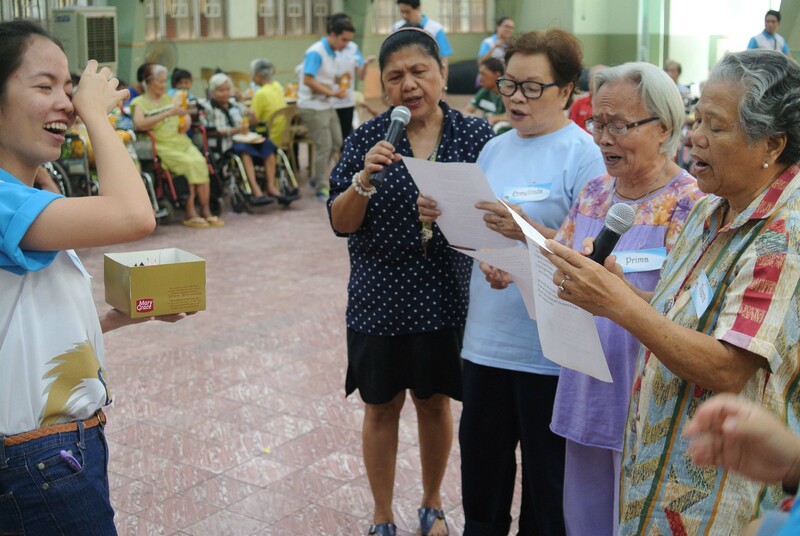 Volunteer Dani Abuel is serenaded by the lolas of Hospicio de San Jose when the Insular Life volunteers visited the welfare institution in Manila with the GK Kids. The volunteer activity coincided with Dani’s birthday. Instead of them making a difference in others’ lives, volunteers also get to be blessed by the lives of the people they interact with. Weekends for many are an escape from reality, two days of much needed rest and relaxation after a long work week. Rather than spend all of it hanging out in the mall, lounging around the neighborhood, watching television, or simply curling up in bed however, Insular Life employees have discovered that volunteering for outreach programs and activities is a more purposeful and fulfilling way to make the most of their weekends. Every 3rd Saturday of the month since 2008, Insular Life employees have been volunteering their time and talent to help the youth through a groundbreaking project with Gawad Kalinga (GK) called Tambayan ng mga Bayani (Tambayani). The Tambayani, initiated in communities such as the GK Manggahan Kawayanan in Marcelo Green Village, Parañaque City, is a learning center that provides educationalprograms for the GK youth through a series of competency training sessions and access to educational enrichment opportunities. Insular Life employees teach values formation monthly at this center, and participate in age-specific, values-based activities that help the youth reach their fullest potential through three sub-programs: GK Sibol (ages 3 to 6), GK Sagip (ages 7 to 13) and GK Siga (ages 14 to 21). These programs also allow the youth to learn from technical and academic skills training, arts and crafts, and even sports. Volunteering for these projects may seem overwhelming given the employees’ busy work schedules. Insular Life volunteer AJ Bautista says otherwise however, admitting that reaching out and helping others gives her a rewarding feeling. “Doing volunteer work actually relieves stress. It is a way to distress my mind and my body. It also makes me feel happier and healthier after talking and laughing with the kids,”she added. Employees who volunteer and give back to the community also get fulfillment from knowing they havemade a positive impact on other people’s lives. “I feel I am making a difference in those children’s livesthrough our monthly sessions. I feel a sense of accomplishment and fulfillment giving people positivitywithout expecting something in return. In fact, I plan to encourage others to volunteer too. I want mycolleagues to experience the fun and to be part of this family,” said volunteer Dani Abuel. Participating in such programs also makes others realize that it is never too late to learn something new. Gretchen Tejoso found that volunteering can open doors to new skills, learning opportunities and experiences, when she was tasked to tour children through the Mind Museum during their field trip. Elmer Saladas on the other hand, said that he enjoys making new friends and strengthening relationships with other employee volunteers. He finds satisfaction in forming bonds and interacting with the program beneficiaries. “Insular Life and the Insular Foundation have always believed that investing in the development of our nation’s human resources through education and skills development is a significant step towards making life better for our countrymen,” said Ana Maria R. Soriano, Insular Foundation Adminstrator. “Our participation in Gawad Kalinga demonstrates the spirit of employee volunteerism and cooperation with the community that benefits all concerned,” she added. Aside from its partnership with Gawad Kalinga, Insular Life also organizes outreach projects to orphanages, homes for the elderly, hospitals, depressed areas, and calamity-stricken areas. Through its partnership with NGOs and other foundations and through its donations, it has supported various causes such as environmental protection, children’s welfare, and social development.